Try over 35 patterns made with the Patttern Maker for Free! Five patterns of magnolias in different arrangements. Over 140 ready-made patterns are included with the Pattern Maker. These patterns can be printed to any size and with any line thickness. Five patterns of flowers in different arrangements. Seven bird patterns, including cockatoos, chickadees, and parrots. 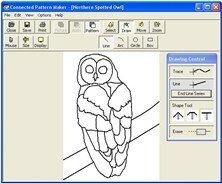 Learn more about the Pattern Maker's features. The classic car example shows how easy it is to create patterns using the Pattern Maker.